The Priory School held its 24th annual QAIS Chess Tournament on Saturday, April 6, 2019. Concentration and calculation were the order of the day as sixty-five students from LCC, Selwyn House, The Study, Notre Dame de Sion, and The Priory competed in a battle of wits and strategy. Chess aficionados led by Frank Teuton and George Levtchouk, and the Priory Chess Tournament Chair, Jennifer Kearney, ensured that the games ran smoothly. Priory students represented their school admirably and we are proud of each and every one of them. Of notable mention are our gold medal winners, Miles Barnaby (grade 1), Phillip Greenberg (Grade 2) and Nicolas Lim (Grade 6, our silver medal winners Minh Duc Phan (Grade 4), and our bronze medal winner Matias Saumet (Grade 1). The winners also qualify for this year’s Provincial Chess Championship to be held on Sunday, April 14th. Congratulations to all of our chess players! Good Luck in the Provincials! Minh Phan (Grade 4) – Where is Alcatraz Prison? Brody Wesetvik (Grade 4) – Why were the Vikings excellent sea travelers? Abigail Dimeny-Kiss (Grade 6) - Who is Frederick Banting? Four Priory students attended the annual Quebec Provincial Honour Band this month, and it was a huge success. Avery Winter, Abigail Dimeny-Kiss, Kristina Schirmann, and Fiona Chu were all selected to participate this year, and they spent their day Saturday with over 150 music students from across Quebec practicing their band instruments with professional musicians and putting on an outstanding concert performance in the evening. The event is hosted at Vanier College each year by the Quebec Band Association and provides students a motivating and enriching experience to become more proficient on their chosen band instrument. Under the guidance of guest conductor Alexis Silver, the students challenged themselves to learn high school level repertoire and perform in a concert for a large audience of over 400 members – well done!! The Priory strives to provide an educational environment that encourages empathy and social responsibility towards others. At The Priory students do not end their learning journey with a test or a bulletin board to show what they have learned, they are encouraged to take their knowledge and apply it to some greater good. Throughout the year, students participate in a number of community service initiatives, learning a sense of responsibility and the joy of giving. As The Priory School makes the term ‘igniting positive change’ a part of everyday vocabulary, our school can proudly say that 100% of the student body participates in regular community service initiatives. Through deeper learning projects and active volunteering, Priory students explore ways to make a difference in the communities in which they live. 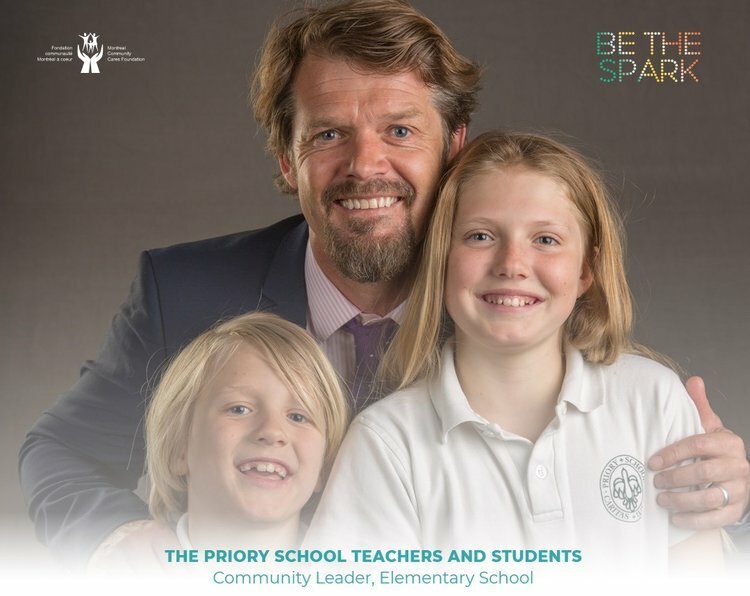 As a true testament to the Priory’s willingness to inspire children to create positive change in the world, the entire Priory teaching faculty and students were nominated and proudly received the 2018 Montreal Community Cares Foundation (MCCF) award for ‘Community Leader, Elementary School’, which recognizes Montrealers for being community champions actively involved in making Montreal a better place to live. Nous sommes fiers de nos élèves qui ont participé à La Dictée P.G.L, un concours international. C’est samedi dernier qu’a eu lieu la finale régionale de La Dictée P.G.L. pour la région de Montréal. Lors de cette journée, plusieurs jeunes de 5ème et de 6ème année ont tenté de déjouer les pièges de la dictée. Parmi eux, 16 élèves se sont démarqués et accéderont à la Grande finale internationale le 20 mai prochain, à Montréal dont une élève du Priory! Félicitations à Marilena Sahlas-Roy et bonne chance! Polar Expressions Publishing of Canada holds an annual national poetry and short story contest to encourage creativity and self-expression. From thousands of entries across Canada, six students from Grade 6 were chosen to have their short stories and poems published in the upcoming Polar Expressions Anthologies entitled "Fly Me to the Moon" and "Chasing Moonlight". Congratulations to Olivia Darlington, Aerin Handa, Angelica Nicastro, Aejandro Rodriguez Pardo, Marilena Sahlas-Roy and Mason Winter for a job well done! The Grade 2 class recently entered the ChickaDEE’s Dream School contest. Students had to come up with an idea for a cool school, draw a picture and describe it in a few sentences. Congratulations to Birch Peters for receiving an honourable mention in the January/February issue of chickaDEE Magazine. Canada’s National Scholastic Chess Organization held its Annual Tournament on February 26th at Collège Jean-de-Brébeuf. Congratulations goes out to Daniel Cabrera-Thompson, Luca Mattei, Oliver Ohanian, Minh Phan, and Valentino Salvatore, for representing their school with great character and pride and congratulations to "Team Priory Pirates" for placing 2nd place in the Chess'n Math Team Tournament. We are proud of you! Students from the Grade 3 class, wrote the Thales National Math Competition which is administered by Mathematica Centrum. More than 60, 000 students participated in this year’s contest. We are proud to announce that 14 of our Priory Grade 3 students have received Certificates of Distinction for scoring higher than the national Canadian average: Maryam Almarzouki, Alec Barin, Sylvia Barrios, Jayson Chako Tchako, Jemima Destine St-Martin, Abigail Dimeny-Kiss, Lesia Emelina, Kennedy Kuperhause, Nicolas Lim, Callum MacDonald, Serena Miller, Alaska Peters, Kristina Schirmann and Avery Winter. A special medal of great distinction is awarded to Alec Barin who has obtained the highest score in the Grade. Congratulations to all Grade 3 participants! Creative Minds Publishing holds a competitive annual poetry contest to celebrate creativity and offer an opportunity to showcase the writing of Canadians. This year, two Priory Grade 6 students have been selected for publication in a national poetry book celebrating young poets. Congratulations to our talented poets and published writers: Roxana Barin and Maeve Harrington. Each year, our Grades 4 to 6 students take part in the Royal Commonwealth Essay Competition. This year's theme was "Team Commonwealth" and one of our Grade 6 students won 1st Prize at the provincial level. Congratulations to Grace McGuire with her short story entitled, "The Brave Ones". Also, Highly Commended honours went to Aidan Price-Gallagher for his short story, "Paw Prints" and to Mary Roper for her short story entitled, "You're One of Us Now". Natasha Ryan received a Commendation for her short story "United We Stand". What would you put in a time capsule that will be opened in 2085? On Friday, May 6th, The Priory's Grade 5 and 6 students witnessed the sealing of the Montreal Neurological Institute's time capsule. Last year, both classes participated in a contest to submit their ideas of what to put into the new time capsule. Winning ideas came from Priory students William Roper and Caterina Alfieri. 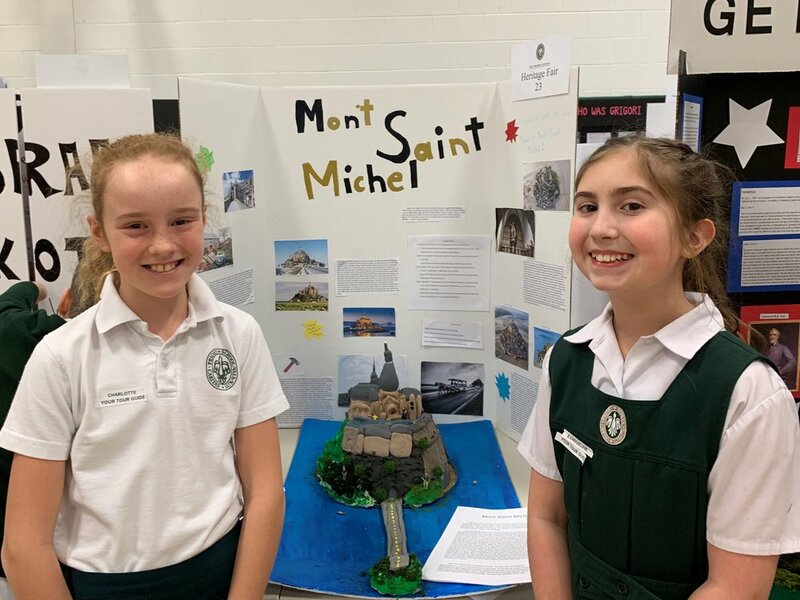 Both students had the opportunity to be a part of Montreal's scientific and historic legacy and were asked to place selected items into the capsule. The capsule was placed in the cornerstone of the Neurological Institute and will be reopened on the Neuro's 150th anniversary in 2085! The Priory School S.W.A.T. Team "Garners Gold"
What do technology and community service have in common? At The Priory School, plenty! 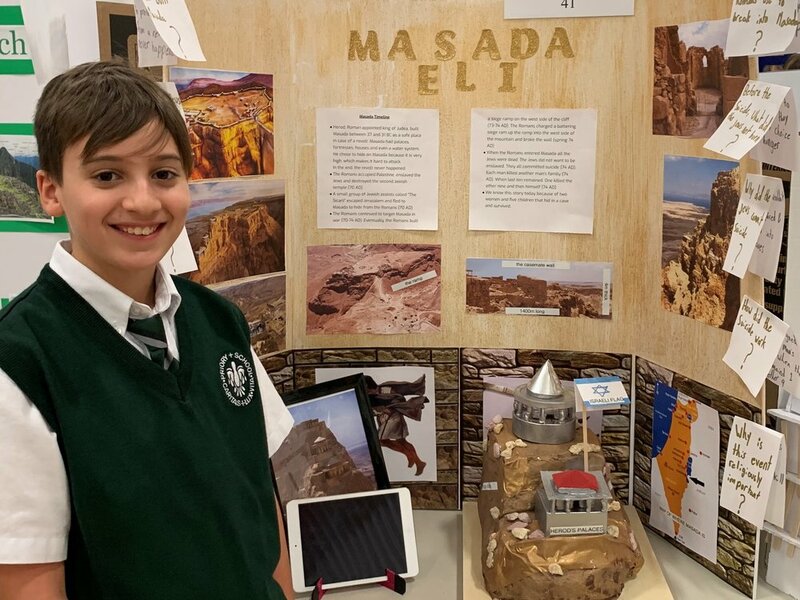 Under ICT teacher Anita DiStefano's guidance, a group of nine talented and innovative grade six students decided to work together to advance technology at their school and to use their creative talents to help others. With this in mind, the S.W.A.T. Team (Students Working to Advance Technology) decided to produce a Priory School Christmas Concert DVD that would be sold to family and friends. The resulting $1447.00 raised was donated to a very grateful St. Gabriel's Food Bank to help needy families in the area. The S.W.A.T. Team then decided to enter the 12th Annual Quebec Entrepreneurship Contest and collaboratively put together a beautiful Memory Book and insightful wiki (web site) http://prioryswat.wikispaces.com/ of their community service endeavors to share with others. The many long hours and hard work preparing this project reaped enormous rewards as The Priory S.W.A.T. Team won first prize in the Quebec Entrepreneurship Contest, Montreal Region for Elementary Cycle 3 and received a cheque for $500 which will be donated to the United Nations Organization. The team project has been selected to go on to the Quebec National Competition. This year, almost 70 000 students were involved in developing 2 729 entrepreneurial projects from all over Québec. Young minds…big ideas, all making a difference!